PUKALANI — As Tyson Haupu was getting well-wishes with a gold medal around his neck, he looked down at his 7-year-old brother Tayvan smiling up at him. More than two hours earlier, Tayvan was watching a video on his phone in the King Kekaulike Gym bleachers. 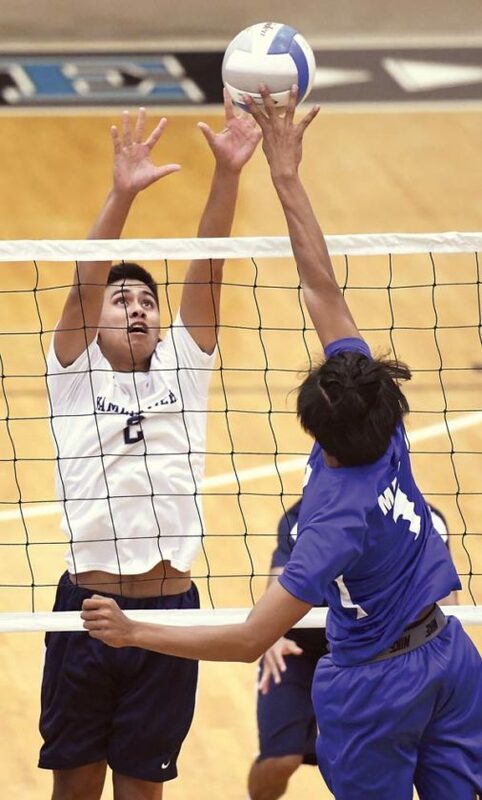 At the end of Kamehameha Schools Maui’s dramatic 25-22, 25-18, 20-25, 23-25, 15-11 win over Maui High, young Tayvan Haupu, a Kamehameha Maui 2nd-grader, couldn’t stop watching the drama in front of him. It was the second straight MIL crown for Tyson Haupu, who had a match-high 15 kills, and his teammates. 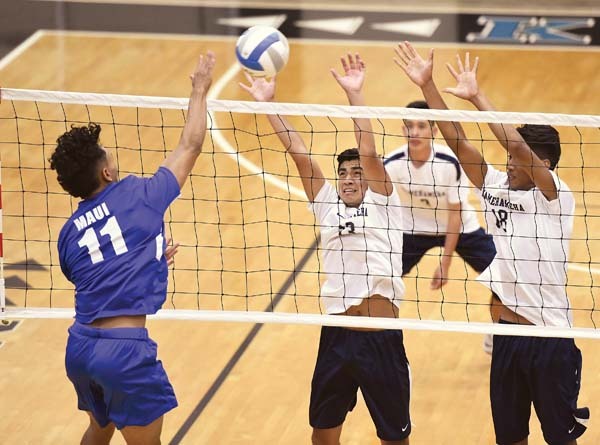 Maui High’s Chey Higashiguchi (from left) hits a first-set ball against the block of Kamehameha Maui’s Austin Peters and Rafael Adolpho on Tuesday. The Warriors (14-0) will be there as MIL champions and the Sabers could join them. Maui High (7-7) will play for its first state berth since 2013 tonight at 6 p.m. at King Kekaulike Gym in a second-place playoff for the final berth. The fifth set was tied 9-9 before before a kill by Hinano Long gave the Warriors the lead for the final time on the night. Long finished with 11 kills — his back-to-back smacks made it 13-9 in the fifth. Kahai Bustillos had three blocks, Brennan Mendez had three aces and Parker Awai had 25 digs for the Warriors. The Sabers’ Jon Aunese attacks the ball in the second set. The Warriors led 7-4, 12-6, and 20-13 in the first set before the Sabers closed within 23-20. An Austin Peters kill gave Kamehameha Maui four set points, and Long put it to bed with a kill off a quick set from Peters three points later. The second set was tied 8-8 before the Warriors forced a timeout from Maui High coach Kenny Houpo with a 3-1 run. Three Haupu kills in a four-point stretch pushed the lead to 14-10. An ace by Denniel Carreon brought the Sabers within 21-18, but the Warriors ended the set on a 4-0 run. Back-to-back aces by Carreon opened a 9-5 lead for the Sabers in the third and forced a timeout from Brede. The Warriors rattled off five straight points before the set was tied at 10. Trailing 16-14, the Sabers ran off a 4-0 stretch, taking the lead on a kill by Jon Aunese and forcing another timeout from Brede. The teams traded the lead before Maui High stretched their advantage to 22-19 and eventually put the set away. The Sabers took a 6-0 lead in the fourth on back-to-back kills by Aunese, and moments later the lead had grown to 10-2. The Warriors closed to within 11-9 before two straight Kamehameha Maui errors and a Chey Higashiguchi kill put the Sabers back up by five. The Warriors rallied to take a 21-17 lead, and Houpo called timeout for the last time in the match. Three kills from Aunese helped Maui High reclaim the lead at 22-21, and the Sabers held off the Warriors as Higashiguchi’s dink forced the fifth set. 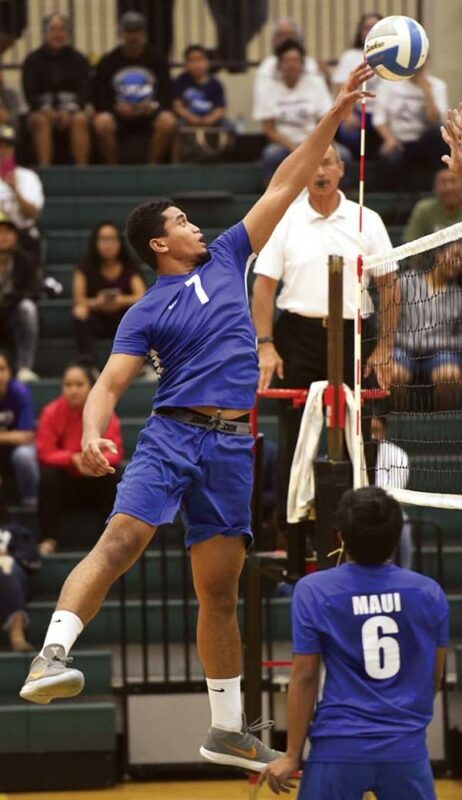 Higashiguchi finished with 14 kills, Carreon had 40 assists and Trent Takara had 23 digs for the Sabers, who face Lahainaluna today in the second-place playoff.